My son Corbin knew one thing for sure when I asked him what he wanted to do for his birthday party this year. He wanted a SUPERHERO theme (which was perfect since The Avengers opened the same weekend). Here are some of the pics from the party! Entertainment for Kids – I had a station set up for the kids to make super hero wrist-bands. I pre-made the bracelets with cardstock, felt, and ribbon. The kids then used shapes and glitter glue to decorate. 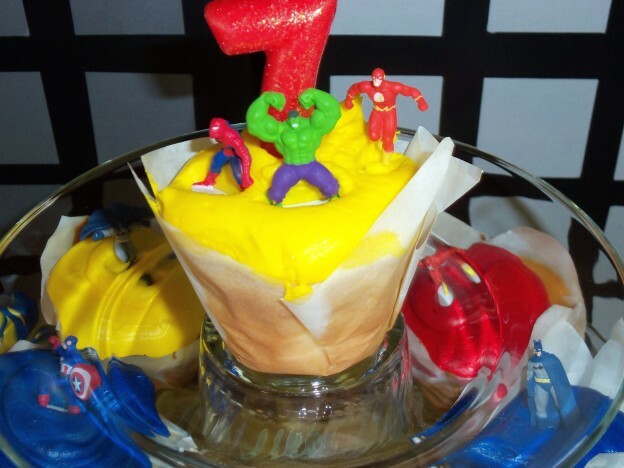 Party Favors: – I had several glass containers that I taped super hero themed powers (Shapeshifting, Laser Vision, and Flying) and filled with candy for the kids to put in super bags. Photobooth: Usually at Halloween Corbin chooses a Super Hero to dress as so we had costumes for the kids to “dress up” in.